So, you’ve grown a wonderful garden that you are proud of – congratulations! However, to keep the garden looking neat and beautiful, you need to invest in more than just a pair of garden shears. Indeed, only the best pole hedge trimmer will assure you of the ability to access tall hedges without a ladder. That said, not all pole hedge trimmers are great. That’s why we have compiled a detailed list of some 11 wonderful options available at your disposal. 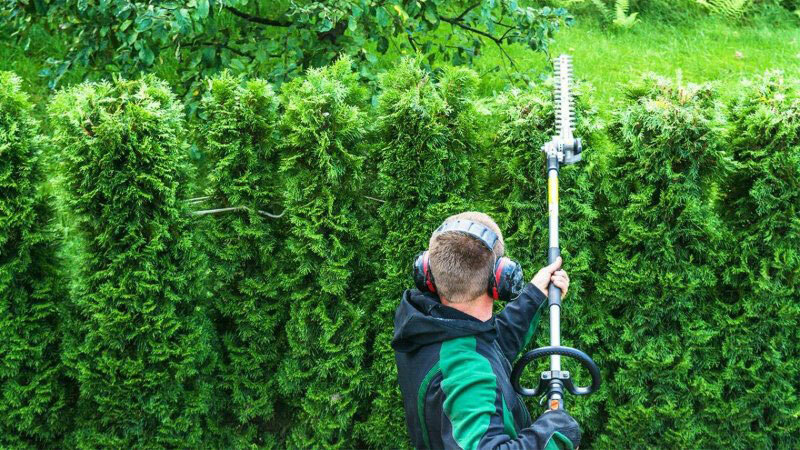 For an easier, faster and safer hedge trimming experience, you’re better off using pole hedge trimmers. With that in mind, here are our 11 best picks. Popularly known as the G-Max 40V, this pole hedge trimmer is probably the most popular under $150 trimmer. It comes with a 20-inch durable blade which works through dual action. The dual action effect means that it also shreds through hedges fast. Once you get this trimmer, you’ll not have to worry about reaching distant heights. This is because it comes with a handy extension shaft which allows it to be stretched for up to 6.5 feet above. That also means that the G-Max is capable of taming most bushes and hedges at full extension. And as if that’s not enough, you also get a multi-position pivoting head. This gives you the freedom to work on multiple sites with great convenience. Sharp blades for taming tough hedges. Difficult to control when the pole is fully extended. Armed with a telescoping shaft designed for flexible use, the DCHT895M1 is a trimmer worthy of your attention. Or is it? Well, to begin with, it comes with a retractable shaft which makes it highly flexible. It also has a 22-inch dual shear blade. The blade is laser-cut hardened which gives it incredible cutting power. Moving on, this trimmer can provide up to 1 hour 30 minutes of run-time. Its battery is quite powerful and light at the same time. And to convert all that power into impact is a brushless motor that delivers 3,700 strokes per minute. For added flexibility, this pole hedge trimmer provides you with 8 locking positions. What’s more? You have the freedom to make adjustments in 15-degree increments. This is a great feature which combines very well with the unit’s no-pull cord design. In other words, you can always bank on the Dewalt DCHT895M1 to eliminate the vast majority of maintenance requirements. For instance, unlike a gas-powered hedge trimmer, this one doesn’t come with air filters, spark plugs or even carburetors. A bit heavy and, therefore, not ideal to carry for long hours. Hedges that are too high up shouldn’t worry you as long as you have the LPHT120 working for you. Designed with a pivoting head, this machine gives you the freedom to trim in all directions. Also, you wouldn’t need a ladder to get the job done. And likewise, you wouldn’t need to worry about your back aching after operating it because of its lightweight. This unit comes with an extendable shaft which is quite strong and stable. Moving on, because this is a cordless unit, you wouldn’t need to worry about being restricted by a cable. In addition, you wouldn’t even have to think about refilling it with gas. Its 20-volt battery has all that it takes to get any job done. However, it’s important to take caution that this battery lasts 30 minutes at best. We wish it would last longer but it seems that, for now, that’s the best Black+Decker can offer. Cordless design for unlimited control freedom. An excellent shaft that can be elongated for 6.5 feet maximum. Tiring to operate when the shaft is fully extended. You have to hold onto the trigger at all times. Earthwise isn’t one of the mainstream hedge trimmer brands. However, if you look closely at its product line, you’re bound to discover quite a few wonderful options on offer. The CVPH41018 is one such example. The corded trimmer comes with an extendable pole that enables you to trim all kinds of shrubs. You only need to push a button to get the job started. Sounds too good to be true? There’s more. This Earthwise pole hedge trimmer is a 2-in-1 machine designed to eliminate the need for a trimmer. It’s also highly versatile, reliable, and powerful. On the flipside, though, it’s a corded trimmer which means it’s quite limiting, unlike cordless trimmers. Great for accessing hard-to-reach areas. Relatively quiet operation compared to gas models. Well thought-out guard for keeping flying debris minimal. Made from lightweight fiberglass material. It’s a bit heavy and can cause hand fatigue when used for too long. Difficult to operate when the shaft is fully extended. It’s time to ditch the ladder and take on the shrubs like a boss. The SJH902E from Sun Joe promises nothing short of perfection. Its extendable shaft comes in handy in reaching high-up branches. On top of that, it comes with stainless steel blades which slice through bushes like a knife through butter. Moving on, this compact trimmer comes with a 4-amp motor which is quite reliable. Of course, this doesn’t measure up to what an average gas-powered machine would deliver. However, if you’re looking for a simple hedge trimmer that can get the job done, this would be a good choice. Moving on, this trimmer comes with a multi-position adjustable head. All you’d need to do is adjust the head position to trim in all angles and shapes. The handle grip could have been better. Makita is one of the few best-known pole hedge trimmer manufacturers from Asia. The Japanese firm has carved a niche for itself with its winning design and consistent track-record. But does its 25.4 CC hedge trimmer live up to expectations? A closer look at it reveals that it comes with a 22-inch double-sided bladed. This is powered by a reliable 4,600 SPM motor. That’s the kind of power you need to handle complex projects like a pro. Besides that, this heavy-duty pole hedge trimmer is pretty easy-to-use. In fact, save for the fact that you’d need to keep servicing the engine every so often, this trimmer is hassle-free to manage. Its sheer power is, however, best suited for commercial work or heavy-duty work at home. Operates relatively quietly with minimal vibrations. Heavier than electrical pole hedge trimmers. Call it a 5-in-1 garden tool or simply an extendable hedge trimmer but the Iglobalbuy is on a class of its own. Powered by a monstrous 52CC motor, this trimmer comes with an extendable pole for easy handling. Further, this heavy-duty trimmer boasts a 10-inch bar chainsaw. This is quite different from basic blades typical of other pole hedge trimmers. Therefore, you can use this unit to handle all complex tasks including cutting tree branches. You may, however, struggle to stabilize it when dealing with delicate and hard-to-reach twigs. On top of that, the heavy-duty design of this cutter makes it a bit heavy. You may struggle to handle it for long hours. Monstrous engine with great cutting power. Can be used for multiple functions. Heavy and incredibly difficult to maneuver at full extension. Quite noisy (thankfully it comes with earmuffs). The Greenworks 22242 is powered by a 24-volt battery. If you’re familiar with pole hedge trimmers you might have an idea how powerful a 24-v unit can get. On top of that, this model comes with a well-designed 20-inch steel blade which is best suited for dual action. Fast forward; this compact tool boasts a 5/8 inch cutting capacity which makes it perfect for trimming hedges and bushes. On top of that, you can look forward to enjoying the power of a 3-position pivoting head design. This unique design gives you unlimited control even when attempting to tame a wayward hedge. And to top it all up, this trimmer from Greenworks operates smoothly and efficiently. You wouldn’t need to wear ear muffs when operating it. On top of that, compared to gas-powered hedge trimmers, this one is light and pretty easy to maneuver. Highly user-friendly combination of features. A powerful Li-ion battery that can trim 250 yards non-stop. Relatively easy to maneuver and get the job done. Can only extend for up to 55 inches. The best multi-angle hedge trimmer is one that lets you enjoy every moment of the job. So, does the Sun Joe SJH902E meet that description? Firstly, it comes with a 21-inch blade which is hardened for durability. Besides that, it is fully-loaded with a 4-amp motor which does an incredible job of powering the blades. It’s no wonder the manufacturer simply refers to it as “Truly a cut above.” Apart from being powerful, this trimmer is maintenance-free. Of course, you only need to make sure it’s connected to a source of power. You can increase your field of operation by investing in an extension plug. Otherwise, you would have to contend with a limited cutting space since this is a corded model. Protected by a reliable 2-year warranty. Compactly designed for easy storage. Powerful steel blade for smoother sweeps. Shoulder strap included for easy-handling. Difficult to manage when its handle is fully extended. Not as powerful as some monstrous machines reviewed earlier. If your current pole hedge trimmer is worrying you with inconsistent power supply, it’s time to give the LPHT12417 a shot. Powered with a moderate 17-inch dual action blade, this unit can always be relied upon to get the job done cheaply. One thing we liked about it is that it has a fantastic battery life. In fact, it takes less than 60 minutes to fully charge and deliver over 25 minutes of run-time. Of course, that run-time isn’t something worth writing home about. But if you’re looking for a trimmer that gets the job done, this one would suffice. Overall, the one factor that makes this an attractive engine is that it provides consistent power. That’s the kind of stability you need to take full charge of your lawns. Operates consistently even when low on power. Easily adjustable carbon weave extension pole. Can be extended for up to 87 inches. Not one of those heavy-duty hedge trimmers. The handle may crack if used forcefully. Armed with a 4.8 Amp motor and a 3/4-inch cutting capacity, the GARCARE hedge trimmer is a well-priced machine. In fact, it boasts a 2-in-1 design which is pretty much all you’ll ever need to keep your lawns looking dapper. Other than that, it comes with a 20-inch laser cutting blade which is equipped with a rust-resistant surface. Therefore, the blade is not only powerful but also easy to clean and maintain. On top of that, the GARCARE boasts a 6-position movable head. It also has a 5-position rotary rear handle which gives it the flexibility to trim even from tricky angles. No doubt, this is a highly compact machine and you can fully rely on it to do any job neatly and professionally. That’s also because it comes with an extendable 9-feet telescopic tube. This tube is made from aluminum which is pretty light in weight. And for optimal convenience, the GARCARE’s handle is equipped with a soft rubber grip. This helps absorb the shock and, therefore, reduce hand fatigue. But despite that fact, this machine is quite huge and bulky. Operating it on a fully extended pole might prove tricky especially to seniors. It’s cumbersome to operate when the pole is fully extended. It's corded and this limits user flexibility. All you need to do to find the best pole hedge trimmer in 2018 is to conduct a simple Google search. However, to separate the very best from the rest, you need to put a few factors into consideration. Corded pole hedge trimmers are a popular choice for household use. That’s because they fully rely on the power plug to run. That said, the cordless trimmers offer more advantages since they don’t limit you to the vicinity of the power plug. However, they come with limited batteries. The gas-powered trimmers are fantastic and people love them for their power but they’re also bulky and difficult to maintain. If you’re planning to use the trimmer around your home, we would recommend a light-weight, ergonomic and user-friendly trimmer. However, for commercial use, you can always go for a rugged unit. Avoid extremely delicate machines. Trimming hedges isn’t as simple as some manufacturers might want you to believe. It’s easy to have a trimmer’s handle snap off in a jiffy and, for that reason, we recommend going for a well-made unit. The cutting capacity boils down to the power of the machine. For that reason, even though battery and corded trimmers are convenient, they tend to offer a limited cutting capacity. So, if you’re looking to make a serious upgrade, you may want to go for a gasoline powered unit. Otherwise, both corded and cordless machines are pretty good at handling most basic tasks. Our best pick so far is the Dewalt 40V DCHT895M1 Pole Hedge Trimmer. We love it for the fact that it’s powerful yet operates quietly. Besides that, it’s well-made, good-looking, and easy-to-maintain. So, the next time you head out to shop for a pole hedge trimmer, remember that quality always precedes quantity. You would rather go for a pricey model that gives you many years of service than settle for a simple, makeshift unit that barely gets anything done.